Following the runaway success of the LeapPad Explorer learning tablet, LeapFrog follow up with a Kindle-type reader for children’s books. Known as My Own Story Time Pad, the toy is also designed to help kids learn their alphabet, improve their reading skills and develop an understanding of phonetics. More than just a simple reader, My Own Story Time Pad can show animations, play music and tell stories. Whilst it cannot connect to the internet, it can be safely used to encourage the practise of texting and emailing for when the kids are a bit older. The console can be personalised with a child’s name as well as their age - and parents can track their child's progress via the LeapFrog Learning Path website. With plenty of educational content available, My Own Story Time Pad is a great introduction to pretend computer play. 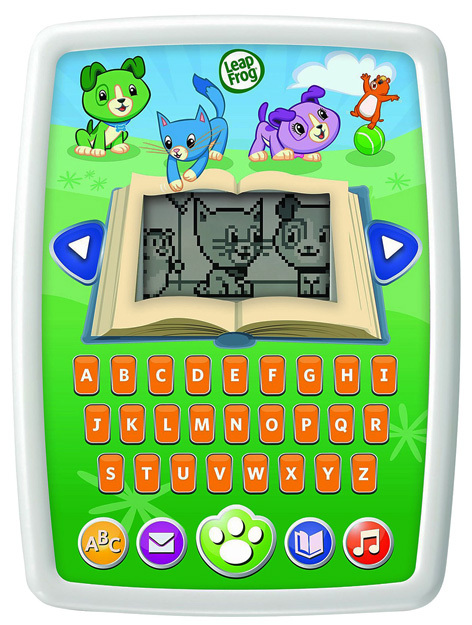 Please tell us what you think of My Own Story Time Pad by LeapFrog.